sportsmandepotsales has no other items for sale. Nice reel, palms well and casts like a dream, at least it does using Berkley Trilene XL 14# line. I find that with bait casting reels, it's important to adjust it with every lure weight change to achieve optimal performance. I have fished it from a Berkley Cherrywood 7' medium rod as well as a Berkley Lightning IM6 Medium Heavy rod and like it on both. 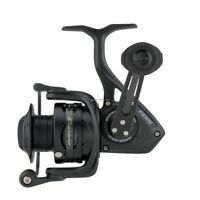 I have the Black Max casting reels, including two BMAX2 that have proven to be every bit as good as the BMAX 3. I'm not a pro fishing individual but a weekly fishing individual who enjoys using dependable equipment. For me this reel is all that I expected and perhaps more. My principle uses are for fishing bass and pike species. Thus far I am happily satisfied with my Abu Garcia reels.